A strong golden coloured winter ale. 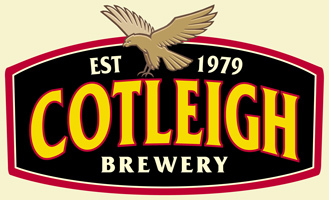 A full bodied long lasting and moreish ale with hints of citrus fruits. Brewed using only Pale Flagon malt with Goldings, Fuggles and Northern Brewer hops. A rich alcohol warming fruit filled experience on the palate. Triple hopped with Hallertau (Mounthood) giving a floral and pear drop aroma. A golden amber IPA style beer with a robust fruit-filled finish on the palate. An aroma of lemon and honey from Bobeck hops. Bottle conditioned, Gold Medal Winning classic old style porter brewed with the addition of flaked barley. Dark and bitter sweet with hints of nut and liqourice from roasted malt. A long creamy and mellow fullness on the finish. Brewed with Pale, Black, Brown and Crystal malt with whole wheat, Fuggles and Challenger hops. Dark amber Mild with a light and fruity taste. Golding and Bobeck hops give a sweet aroma with a refreshing liquorice taste on the palate. 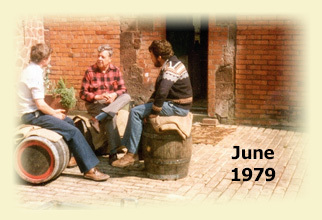 Brewed to celebrate Cotleigh's 35th Anniversary (1979-2014). The aroma is a medley of summer fruits emanating from the New Zealand Motueka hops and the taste is a zesty hop punch that you would expect from a traditional IPA. Celebrate the World Cup with this bright golden bitter. Smooth and malty with a background of honey flavour offering a refreshing and citrus smooth finish. A copper coloured pale ale with a rich malty taste, with a citrus hoppy aroma from a late-harvested hop of Styrian Goldings. A beer equivalent of a Beaujolais Nouveau using Early Bird Goldings hops. Fresh, clean, hoppy and exciting in aroma and taste. Sherbert nose with a hint of liquorice and grapefruit. A richly flavoured deep copper coloured seasonal beer and Gold Medal Winner. A smooth long lasting finish with chocolate, toffee and nuts. Brewed using Pale, Crystal and Chocolate malt with Goldings, Fuggles and Northdown hops.